A file photo of telecom minister Kapil Sibal. Smart politicians manage to steer public attention towards those issues they want the people to debate. They trigger the debate, bend it the way they want, let it influence public opinion in their favor and end it when they want. It is an art, and a matter of tactics. Look at Tamil Nadu chief minister Jayalalitha. Immediately after launching special initiatives such as providing free laptops to students and milch cows and goats, the newly-elected government, has, by mid-November, raised the price of milk from Rs17.75 to Rs24 a litre and increased the bus fares too. The state is even planning to suggest new prices for electricity. Before the cries of foul from the opposition and the activists get shrill, the chief minister and the ruling party raised the pitch on an emotive issue – the Mullaperiyar dam. The panic created by politicians in the neighboring Kerala over the fragility of the dam has helped the AIADMK government tide over the public anger against the steep increase in the cost of living. Similarly, Jayalalitha’s counterpart in West Bengal, Mamata Banerjee, has also succeeded in putting the governance failures or absence of policy initiatives by posturing on controversial issues like increase in the petrol prices and foreign direct investment. Banerjee’s Trinamool Congress came to power with landslide majority dethroning a more-than-three decade old Communist government, but she has failed to keep the confidence and hopes of people for a change, let alone a visible change. However, the public posturing and the rhetoric on such issues that the Left would have put the UPA -- in which she is an active partner - on mat have helped her save herself from vehement criticism of inaction. However, the same does not seem to be working for the UPA. Union minister Kapil Sibal tried to deviate attention from a range of controversial issues that had been plaguing the UPA government by dropping the bomb on censorship of social networks. Sibal’s idea, which has been pooh-poohed by advocacy groups and experts, was disclosed at a time when the government was under fire from left, right and center for its decision to allow greater participation of foreign retail giants in the domestic sector. The UPA’s spin doctors were more troubled over the impending embarrassment from anti-graft activist Anna Hazare’s proposed one-day fasting on Sunday. The media coverage Hazare manages to get has been a constant worry for the UPA. Privately party leaders keep suggesting to journalists that Hazare and team will be reduced to nil if the television cameras and newspapers stop the coverage. Congress’s expectation was that Sibal’s sword on “blasphemous" content on television and internet would dominate the public discourse and replace Hazare’s jibes against UPA and its leaders on television screens. In fact, the issue did keep Hazare as just one of the headlines for a few days. An apparently disappointed Hazare directed his attack to Congress general secretary Rahul Gandhi – a weak point for many Congress leaders. (Hazare may have feared the public reaction if the hospital-returned Sonia Gandhi is attacked) The ruling party showed some brilliance there – their reactions to Hazare’s attack on Rahul Gandhi were very subdued. 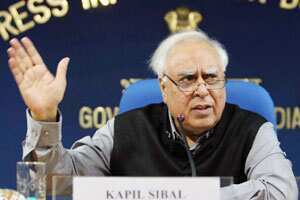 However, Sibal could not get what he wanted, except the condemnation and criticism from all across the globe. The cases are bad; the client is no better. He appeared for his ’valued colleague’ P. Chidambaram. The case: 2G spectrum controversy. Sibal said, “the government is concerned that the public arena is being converted into forum for a public trial of allegations and counter-allegations". Allegations of a political nature can be made only in public. To counter it, you need political tactics. Let the madam-led UPA learn them from the ladies.